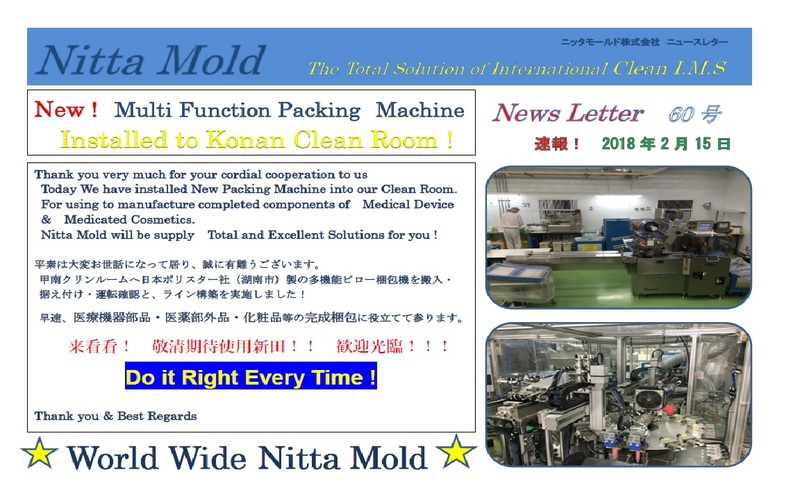 Installed to Konan Clean Room ! 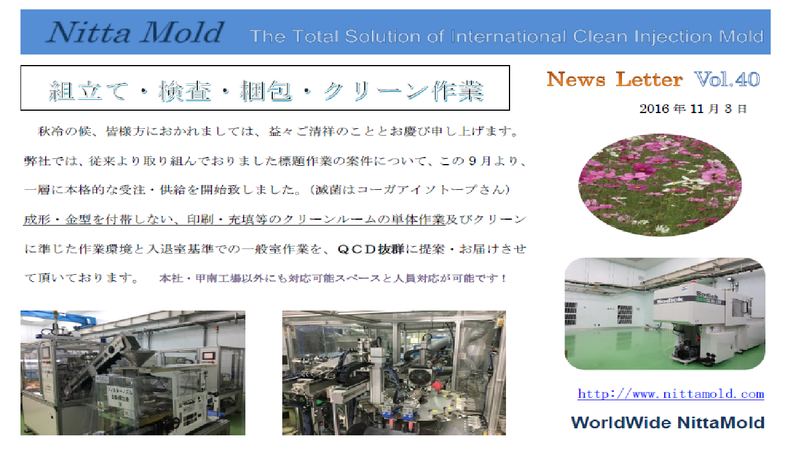 Today We have installed New Packing Machine into our Clean Room. 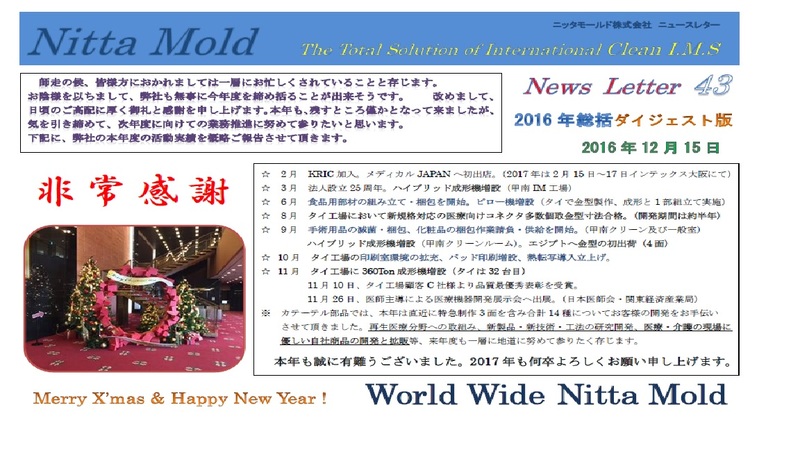 Nitta Mold will be supply Total and Excellent Solutions for you ! Do it Right Every Time ! How are you doing ? I hope you are getting Well ! 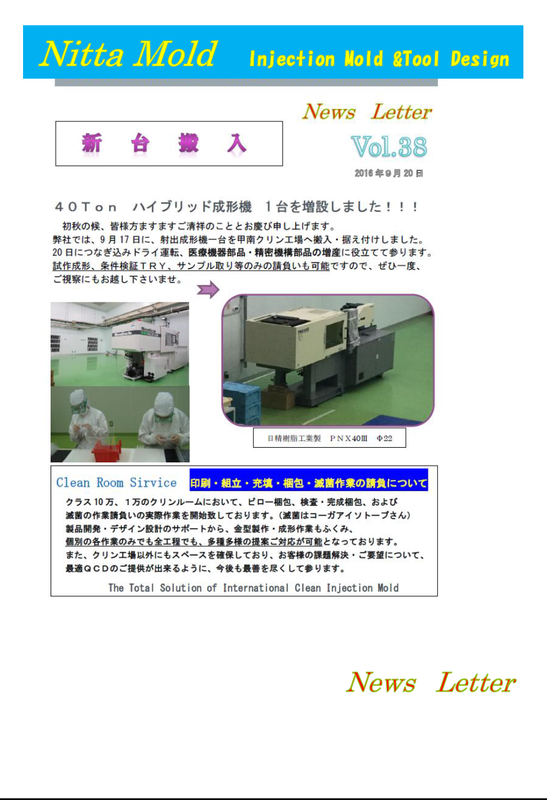 Special Service by our Clean Room. 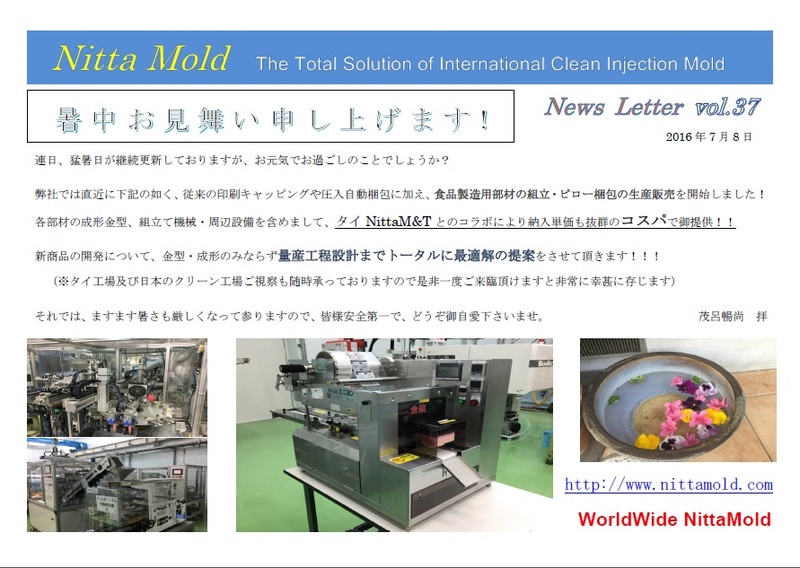 We wish,Nitta growing up to provide more excellent result for you. 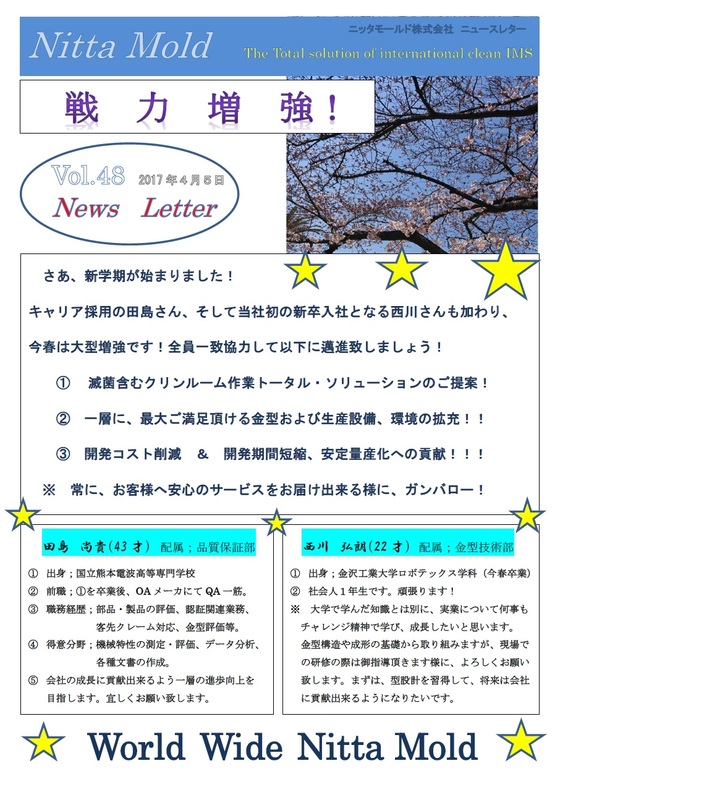 ☆	Mold Business;　Over 250 molds. Thai:　200 molds. 2machining installed for mfg mold base inside NMT Factory. 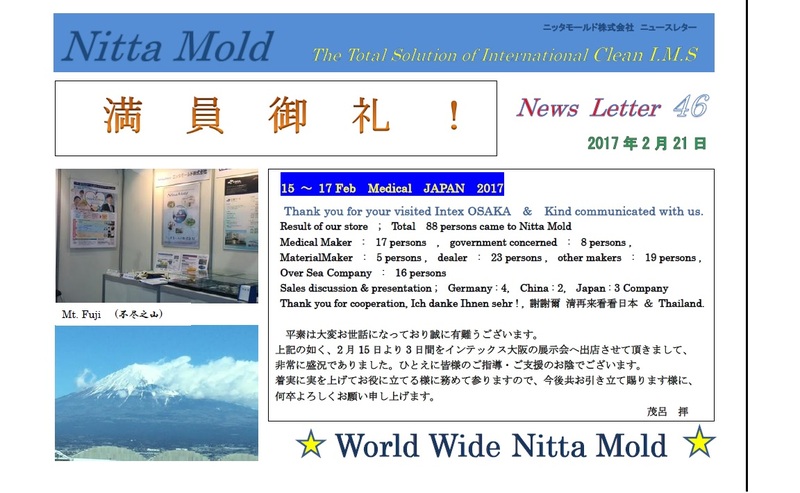 Japan: 50 molds including Over Sea Sales. 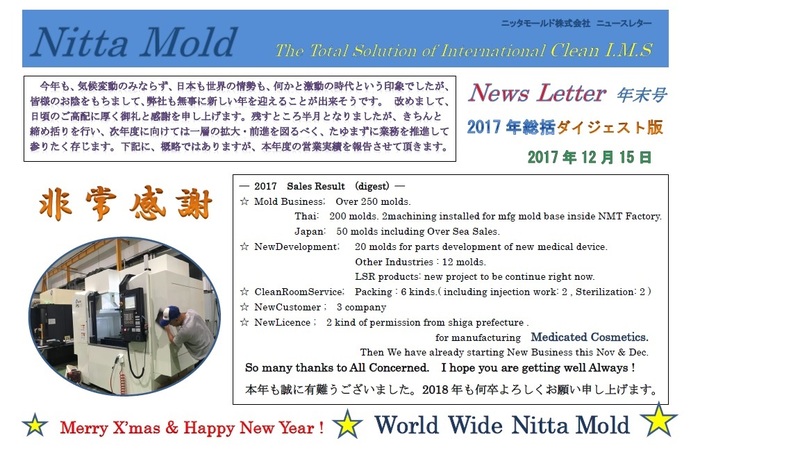 ☆	NewDevelopment; 20 molds for parts development of new medical device. 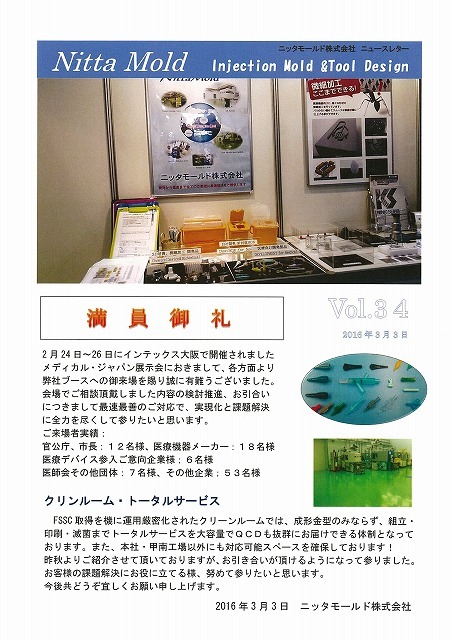 Other Industries : 12 molds. 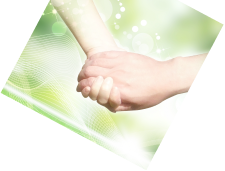 LSR products: new project to be continue right now. 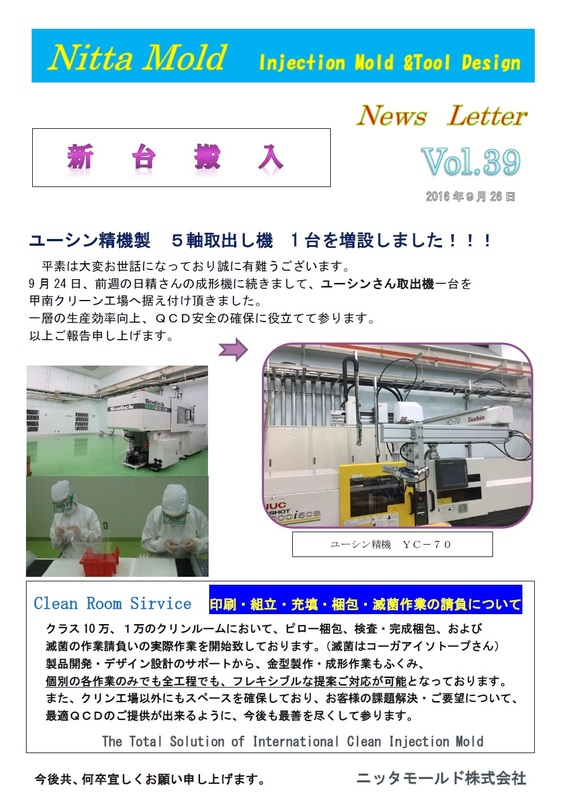 ☆	NewLicence ; 2 kind of permission from shiga prefecture . Then We have already starting New Business this Nov & Dec. So many thanks to All Concerned. I hope you are getting well Always ! 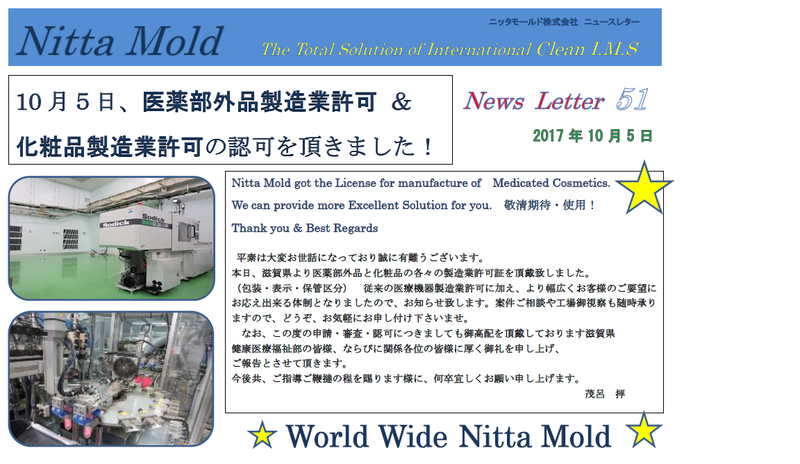 Nitta Mold got the License for manufacture of Medicated Cosmetics. 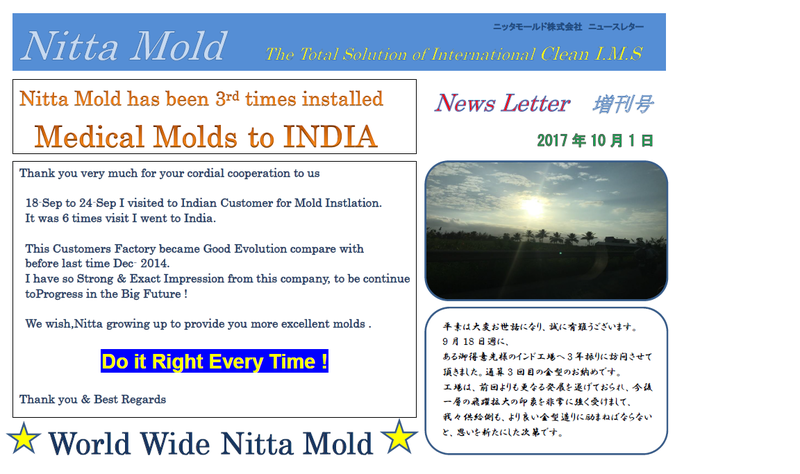 18-Sep to 24-Sep I visited to Indian Customer for Mold Instlation. It was 6 times visit I went to India. before last time Dec- 2014.
toProgress in the Big Future ! 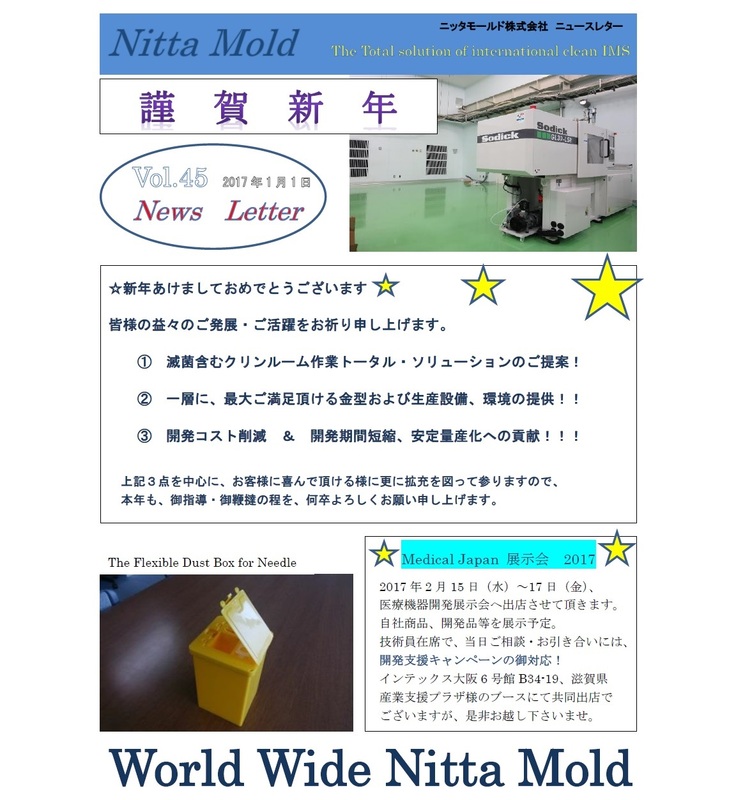 We wish,Nitta growing up to provide you more excellent molds . How are you doing ? I hope you are getting well ! 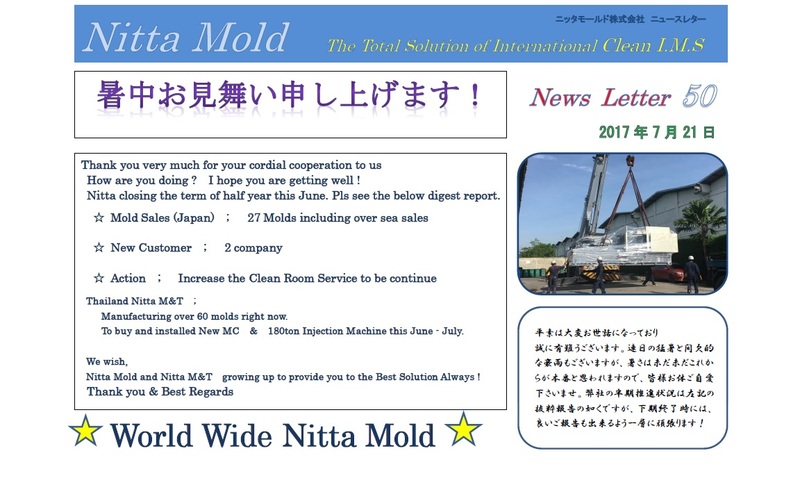 Nitta closing the term of half year this June. Pls see the below digest report. Manufacturing over 60 molds right now. 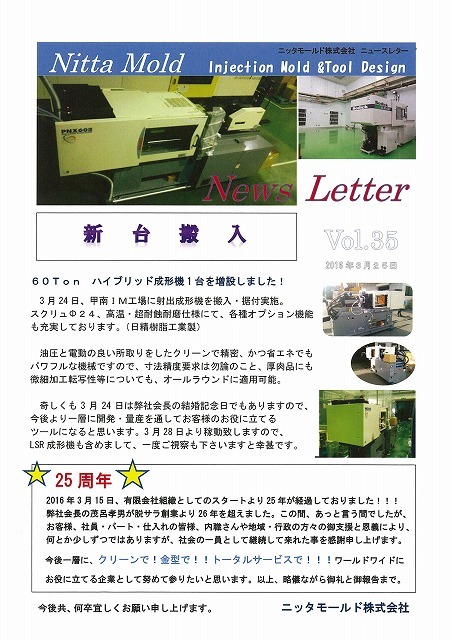 To buy and installed New MC & 180ton Injection Machine this June - July. 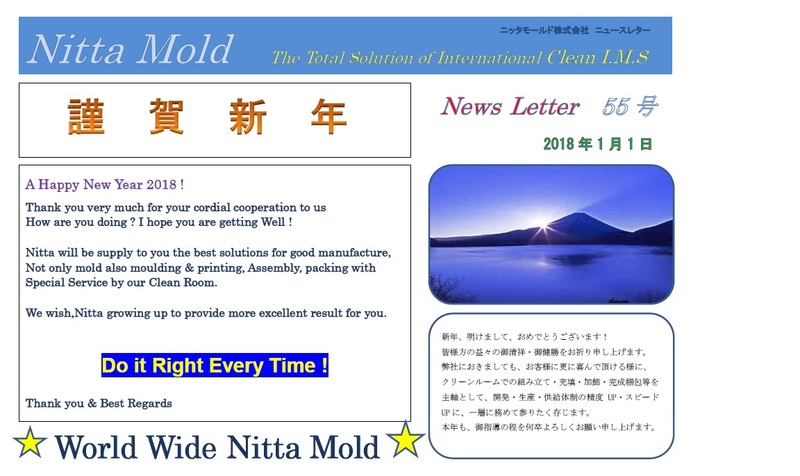 Nitta Mold and Nitta M&T growing up to provide you to the Best Solution Always ! 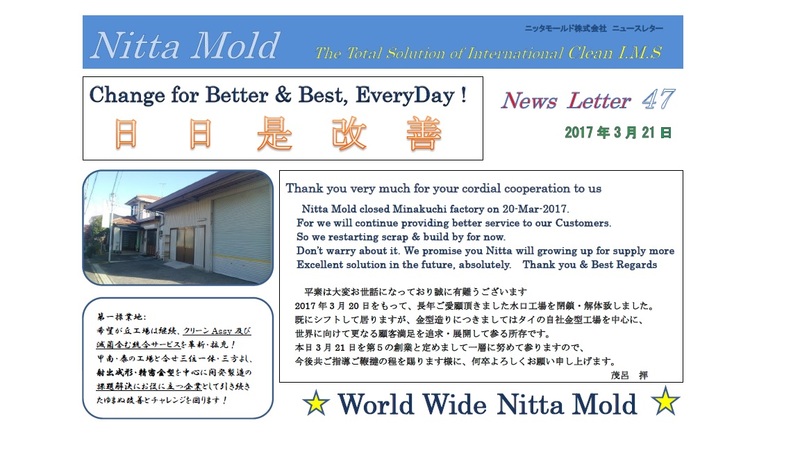 Nitta Mold closed Minakuchi factory on 20-Mar-2017. For we will continue providing better service to our Customers. So we restarting scrap & build by for now. 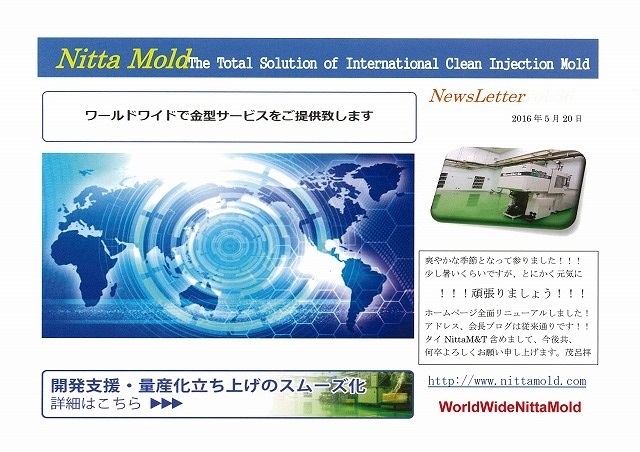 Thank you for your visited Intex OSAKA & Kind communicated with us. Thank you for cooperation, Ich danke Ihnen sehr ! 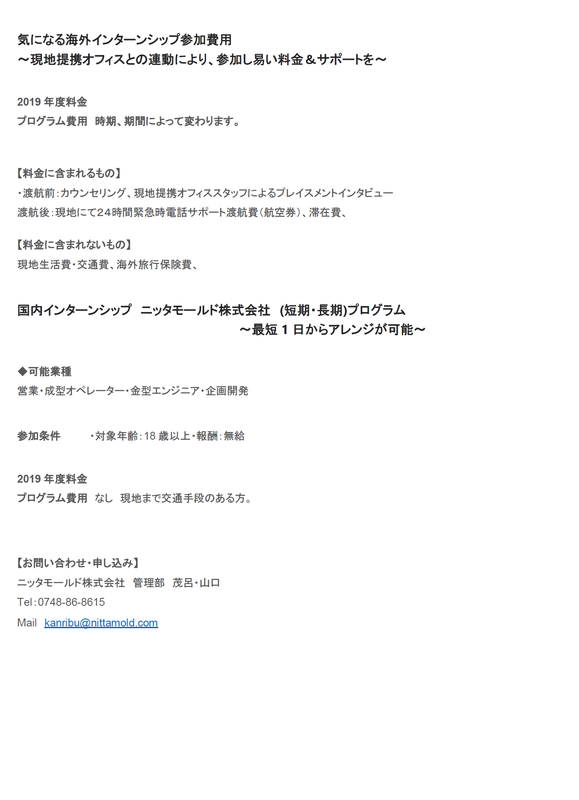 , 謝謝爾 清再来看看日本 ＆ Thailand.